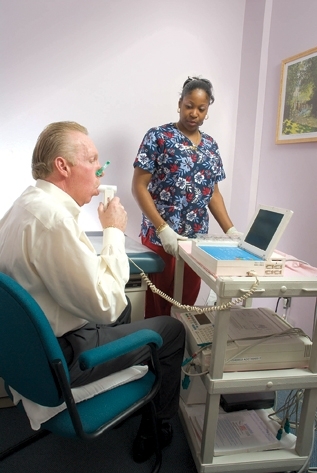 Spirometry is a lung function test used to help diagnose or assess a lung disorder or to monitor treatment. The spirometer records the total volume of air breathed out, known as the forced vital capacity (FVC). It also records the volume of air breathed out in 1 second, known as the forced expiratory volume in 1 second (FEV1). In obstructive lung disease (such as asthma, emphysema, and chronic bronchitis), the FEV1/FVC. ratio is reduced because the airways are narrowed, thus slowing expiration. In a restrictive lung disease (such as idiopathic pulmonary fibrosis), the FVC and FEV1 are reduced almost equally with little change in the ratio. This is because lung expansion is limited but the airways are not narrowed.